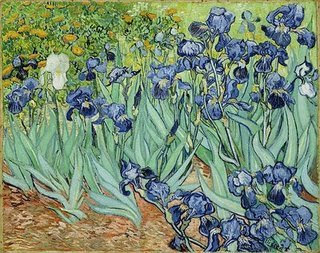 This month's Art Bead Scene challenge is to focus on the theme of the painting by Vincent VanGogh Irises. This was tougher than I thought! First of all, I don't have beads remotely close the colors in this painting. Secondly, How should I emulate irises with beads? GAH! I was asked recently in a blog comment if I was going to submit this month, so I decided it might be fun to try. Now that I look at the painting again, the irises look more blue than purple. At least I got the greens right. So my inspiration wasn't about the flowers, but was more about color. I used buttons. And brass wire. And Czech glass rounds that are a beautiful purple color. And the focal was a heart that I just got in the mail last week from the very talented Lynn Davis of ExpeditionD. I tied the heart onto the necklace using some of Lynn's hand dyed ribbon that has a little bit of purple in it. My favorite part of the necklace is where I inserted buttons into the center of a handforged brass wire loop. I wrapped the button in with some brass wire so that it would look almost stitched on. Wish me luck! There are a lot of FABULOUS entries already submitted! Go see them here! I like how you did the stitching thing, Lorelei, now my head is buzzing with how I could do that with some of the other two-hole connectors I've been making, even the oval one you made that great bracelet with. I'd have to make the wire part much bigger... hmmm, I want to try that out now. Thanks for the gorgeous use of that little heart! Lovely - I especially love the "stitched" technique too! Another great piece! I am loving the new button techniques! So cool! I love the way you put these ideas together and how it all works so nicely. I'm also enjoying Lynn's comment, as I was inspired by your bracelet to purchase Lynn's Asian connectors and now I have some more ideas on how to play with them when they arrive, although just as they are would be great, too! I also enjoy your etsy favorites. You have almost enough owls to make an etsy Treasury with! Wow, it's so sweet and beautiful. I love it! I could go on and on over this one. And, I love that lilac color!! Oh my, your necklace is just beautiful. Living in Southern California, I get to see Van Gogh's Irises often. It's at the Getty Museum and is simply breathtaking. You've captured the colors so nicely. Well done, very pretty! ooohhh ahhhh! Love it, beautiful work as always! This necklace is really cool, Lorelei! I love the whole feel of it. It's modern, sweet and vintage all that the same time!